IDAK Job Search is based upon the client’s individual needs and is facilitated through a one-on-one coaching and training experience. The client receives take-home learning exercises and audio instructional CDs which complement the weekly office sessions. Offered in four-week and eight-week instructional sessions. This is our most comprehensive counselor-guided service. 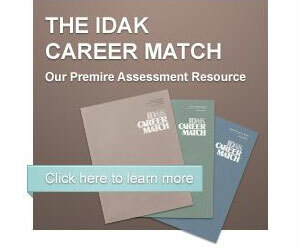 It combines our extensive Career Assessment Service (two weeks) with eight additional weeks of job search coaching. Includes a Job Search Handbook with 14 audio instructional CDs which cover resume preparation, interview preparation, development of employer contact list, setting appointments, negotiating offers and more. Our specialty is coaching you to find positions where a person has no prior experience by finding the hidden jobs which are filled before they are ever listed. All best matches are numerically coded so as to link up with websites which list employers in your local area. This service combines our Career Match Assessment, personality and temperament testing and personalized counseling to help people over 30 maximize their full potential and make the most of life’s second half.